We present a sequent calculus for formally verifying modal μ-calculus properties of concurrent processes. 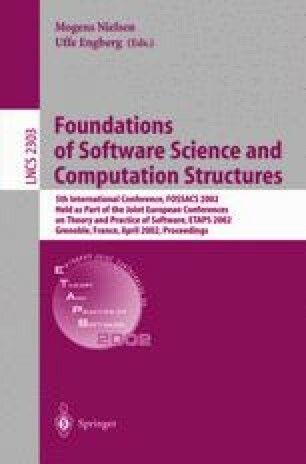 Building on work by Dam and Gurov, the proof system contains rules for the explicit manipulation of fixed-point approximants. We develop a new syntax for approximants, incorporating, in particular, modalities for approximant modification. We make essential use of this feature to prove our main result: the sequent calculus is complete for establishing arbitrary μ-calculus properties of context-free processes. U. Schöpp. Formal verification of processes. MSc Dissertation, University of Edinburgh, 2001. Available as http://www.dcs.ed.ac.uk/home/us/th.ps.gz.